New York : Gramercy Books, c1997. Here, the illustrations alone are worth the price of admission. The reproductions are of a very nice quality, and in most cases the author has managed to use the original pieces, devoid of the typography the pulp magazines slapped on. The book is a visual delight. The text is also interesting and informative, though the scholarship felt a little off-kilter at times. There were a couple of facts that I know for certain to be wrong, and a few other places where the author introduced interesting ideas but never followed through with them. The most glaring, thing, though, was that the rest of the book belied his introduction. Lesser opens the work with the statement that Americans don't judge art by its origins, and that even commercial art is highly valued in American society. 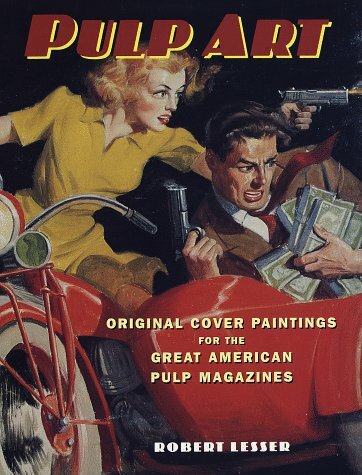 He proceeds, throughout the rest of the book, to describe just how reviled and undervalued pulp art has been and continues to be, finding acceptance only with a select few collectors and fans.